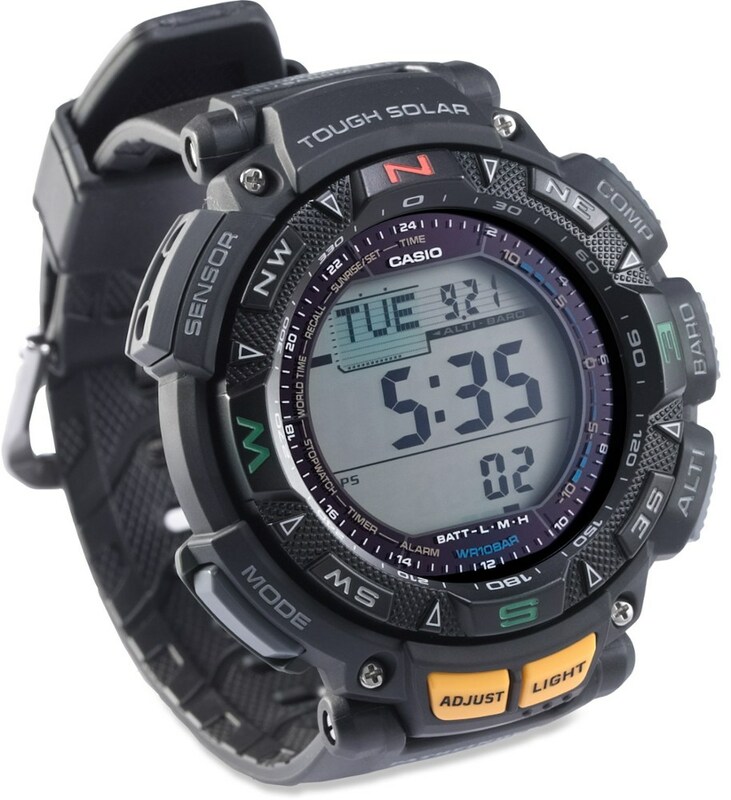 Solar-powered altimeter, barometer and compass (ABC) watch with temperature sensor, world time, stopwatch, and timer. 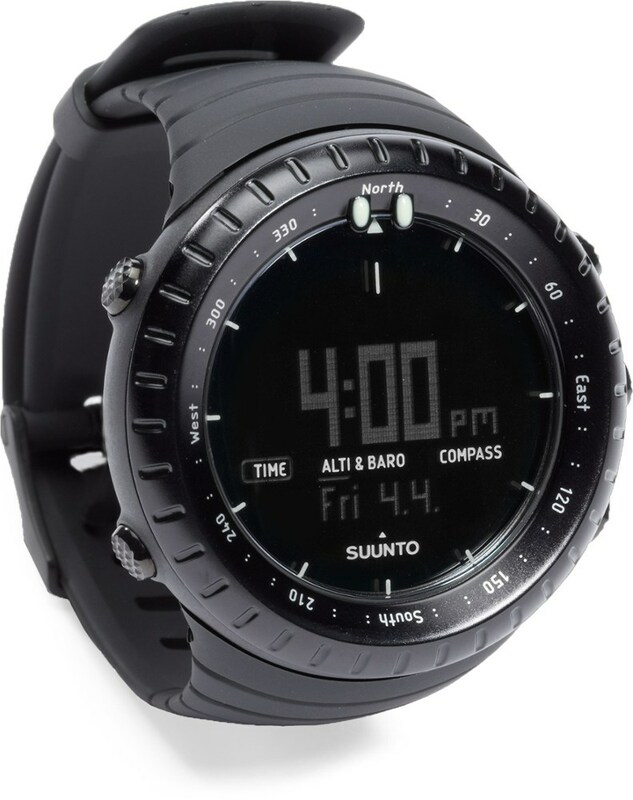 Suunto and Garmin watches represent the gold standard in hikers’ watches and the Casio PRG270 will inevitably be compared to them. 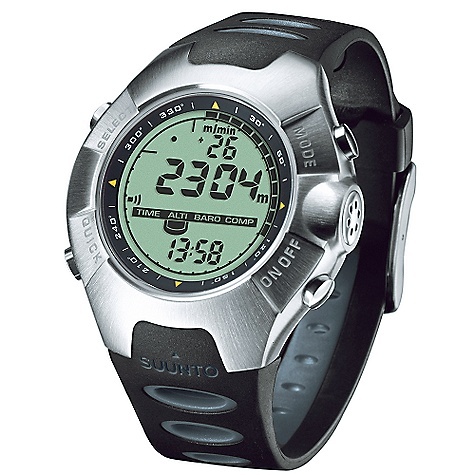 However, it should be kept in mind that the PRG270 is basically an altimeter, barometer and compass (ABC) watch, with the addition of a temperature sensor, world time, stopwatch and timer. It does not have GPS or advanced athletics functions, and it does not connect to your smartphone like the Garmin Fenix 3. Leaving aside these key differences, the main advantage of the PRG270 over Suunto and Garmin watches is that it is solar-powered. Initially the PRG270 can take a long time to reach full charge if you try charging it indoors. Even exposing it to direct sunlight from behind glass won't do the trick. It needs to be taken outside to charge quickly. The watch has a charge indicator with three levels—low, medium and high—and once the watch is fully charged it will stay at high even with intensive use provided it is kept where it belongs, on your wrist out in the open. The main disadvantage of the PRG270 is its clunky user interface. Checking the altimeter, barometer or compass is easy enough because there is a labelled button for each. But anything else—for instance, calibrating the altimeter, using the timer, or logging ascents—requires a sequence of button presses that has to be memorised. These button press sequences are hard to remember and easy to forget. If you stop using the watch for any appreciable amount of time you will have to learn them all over again. 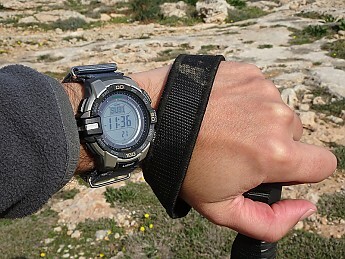 This watch succeeds the PRG240 in the Casio Pro Trek range of hikers’ watches. 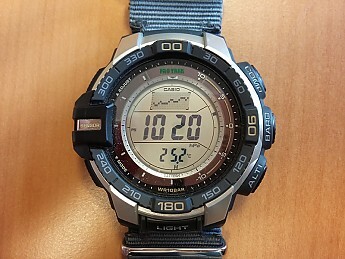 The PRG270 includes Casio’s Version 3 triple sensor, which is smaller, less power-hungry and more capable than the previous version. Like the PRG240, the 270 is rated as water resistant to 100 metres or 330 feet. (This measures static pressure, which basically means that you can swim but not dive with this watch—certainly not down to 100m.) 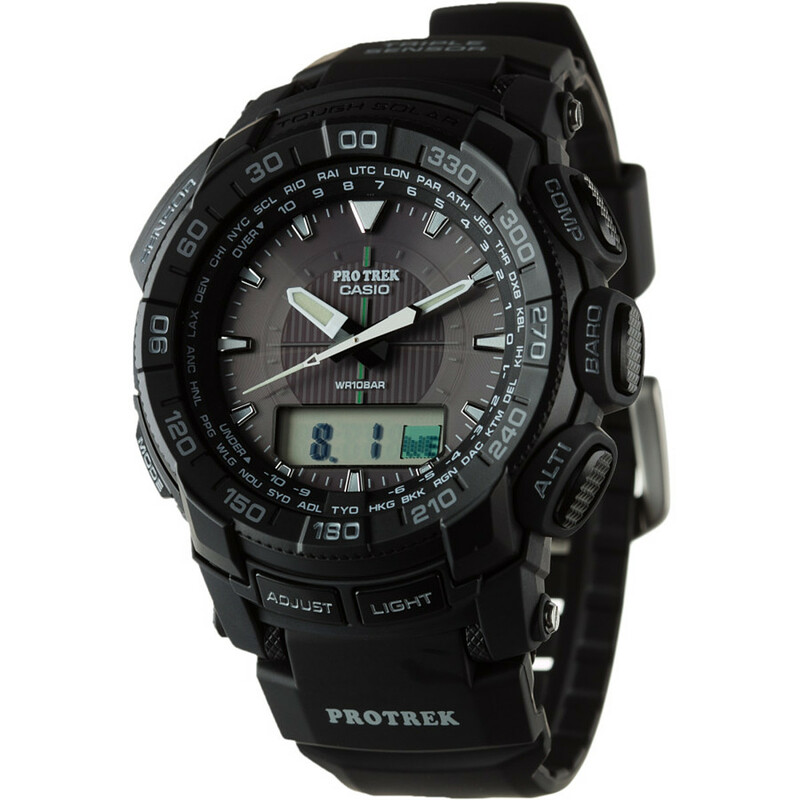 More expensive Pro Trek models offer 200m water resistance and radio-controlled timekeeping. The latter seems an unnecessary luxury given that the PRG270 keeps time very accurately without it. As far as I can tell the sensors on the PRG270 are reasonably accurate, with two caveats relating to the altimeter and temperature sensors. 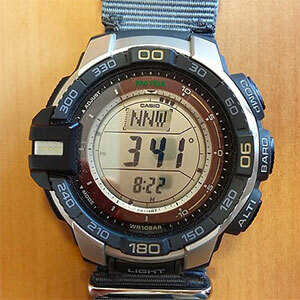 The altimeter has to be calibrated often with reference to known altitudes at particular locations so as to take account of changes in air pressure due to weather. But this applies to any altimeter watch. The temperature sensor works well only when the watch has been off your wrist for 20 to 30 minutes since—quite understandably—it would otherwise be affected by your body temperature. As a newcomer to camping I find the temperature sensor useful at night, with the watch hanging in my tent, to gauge the temperature range within which my sleeping gear will keep me comfortable. But you have to be quick when you check the temperature because as soon as you touch the watch the temperature reading starts to climb. Experienced hikers advise against using a compass watch for navigation purposes. I have a dedicated GPS unit with its own electronic compass, plus a magnetic compass as backup. Still, I have found the watch compass useful for quick reference where precision is not important—for instance, to pitch my single-hoop tunnel tent in line with the wind direction that is forecast for the night. The other main benefit of the watch to me, besides telling the time, is keeping track of barometric pressure changes at night. My GPS unit does have a barometer but it is battery-hungry so I prefer to switch it off for the night and rely on my watch. 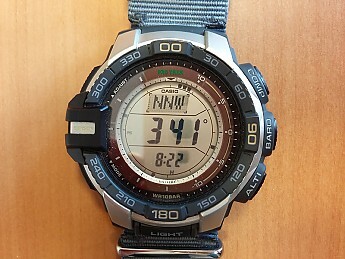 Moreover the watch has an alert feature to warn of rapid changes in barometric pressure, which can presage bad weather. My GPS does not have this facility. The watch comes in a variety of different colours and with either a metal or resin band. I went for the version with the metal band (PRG270D-7) for the sole reason that it was on offer at a good discount. I immediately swapped the band for a nylon NATO strap because I find these straps more comfortable and they avoid clammy wrists in hot weather. 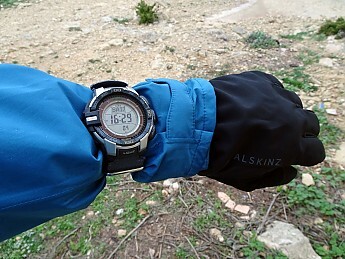 They are also adjustable in length so I can wear my watch over the sleeve of my rain jacket if I need to, as shown in the photo below. I used a 26mm strap but I had to make cutouts to fit the watch lugs—not, I admit, the neatest of arrangements. The alternative would have been to use an 18mm strap to fit the gap between the lugs, but it would have looked ridiculously narrow on a watch this size. 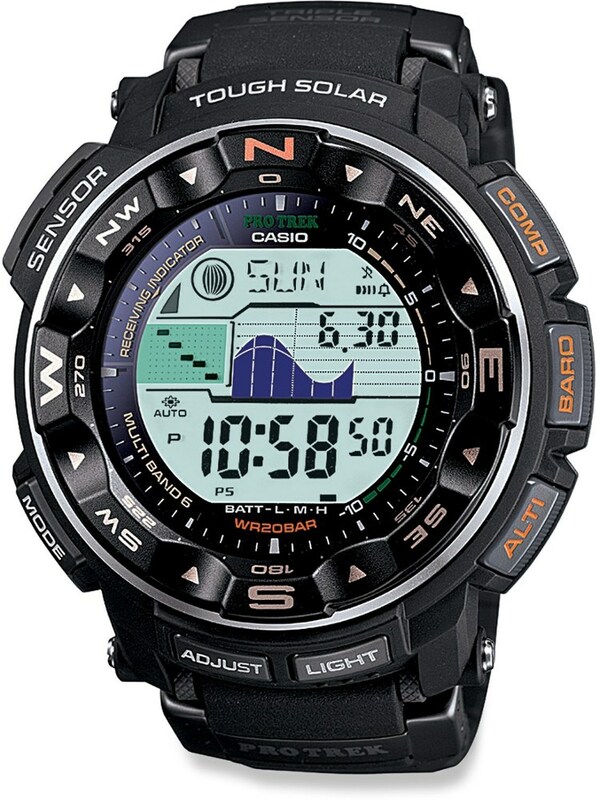 Speaking of size, the watch dimensions as given by Casio are 54.6mm x 52.4mm by 14.4mm. It’s a big watch and I have small wrists (6.25 inches). 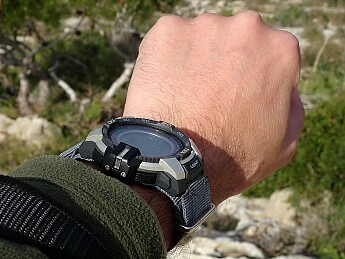 But as the picture below shows, the watch does not overwhelm my wrist. It is rugged and well priced, with all the features I need and more. I’m happy with it. Great review, Charles! Thanks for taking the time to share it. You're welcome. This site has been useful to me in the past so I'm glad to give something back. 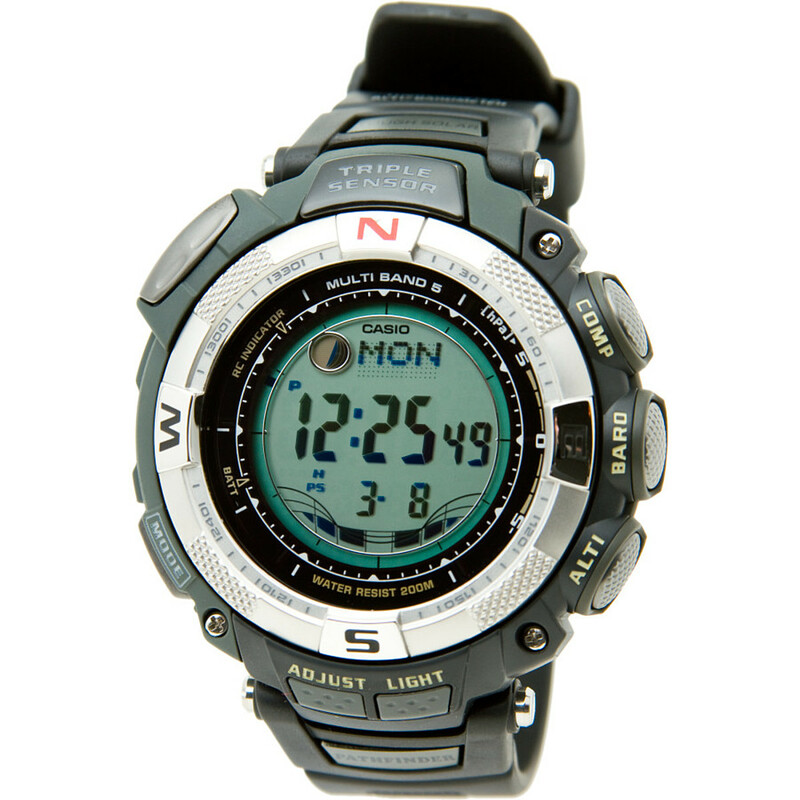 The Casio PRG270 is not available from the stores we monitor.